Welcome back to another installment of Tutorial Tuesdays! Do you love Nuvo drops as much as I do? Ever wondered if you can do more with this fab product? 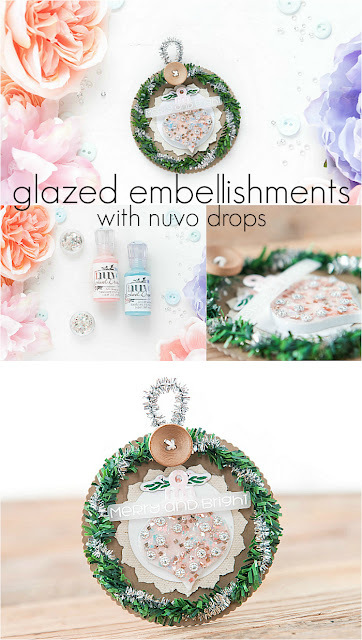 I've been experimenting lately and today I'm sharing a quick and easy tutorial on how to create glazed embellishments with this lovely product, for a touch of sparkly dazzle! 1. 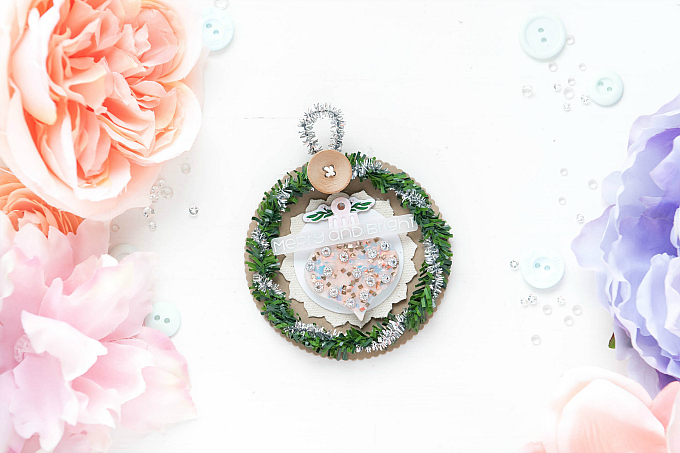 Start with your embellishment base - preferably a thicker material that won't buckle, like foam, chipboard, or thick cardstock. I love using the leftovers from this sweet kit. 2. If your base is not already die-cut + sticky, add this adhesive sheet, and diecut with your choice of dies. 3. 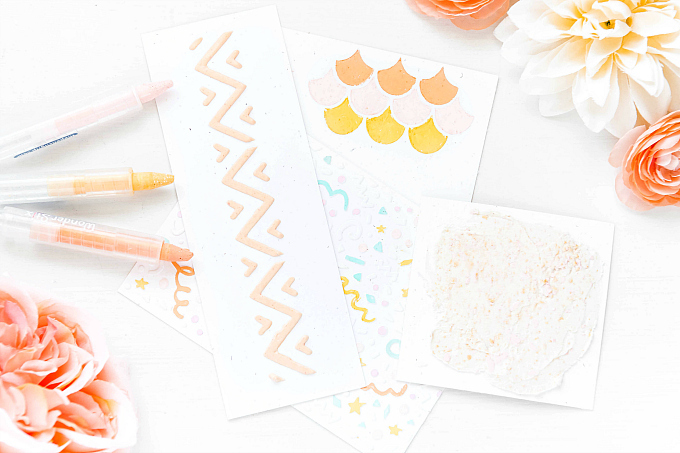 Peel the adhesive film, and dip your embellie into your favorite glitter. Feel free to make your own mix as I do. 4. To glaze the ornament, simply cover your entire surface area with Nuvo Jewel Drops - they dry clear and are ever-so-slightly-tinted. 5. Use a needle to even out the glaze, or pop any air bubbles. 6. 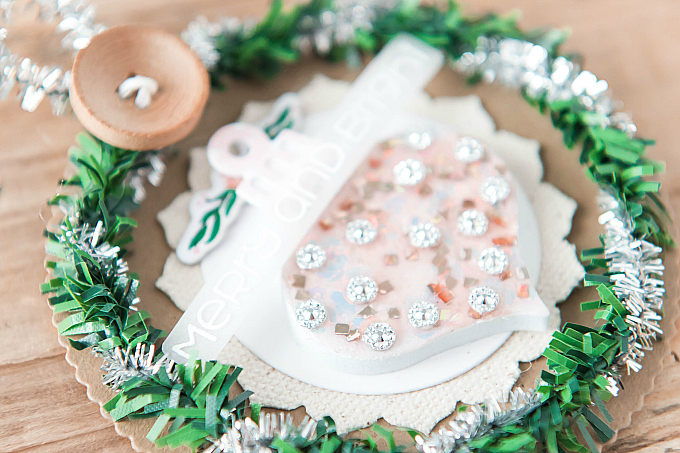 Gently add rhinestones on top of the glaze (optional) and let dry. 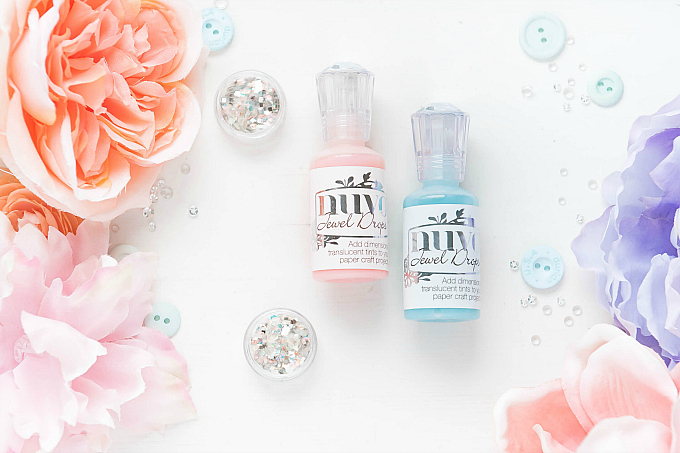 Since Nuvo Drops are not intended for covering a large surface area, it takes a little longer to dispense the product, but this also means it's easier to control how much is applied. If you get impatient, simply remove the applicator tip with some pliers and use a popsicle stick or palette knife to apply. 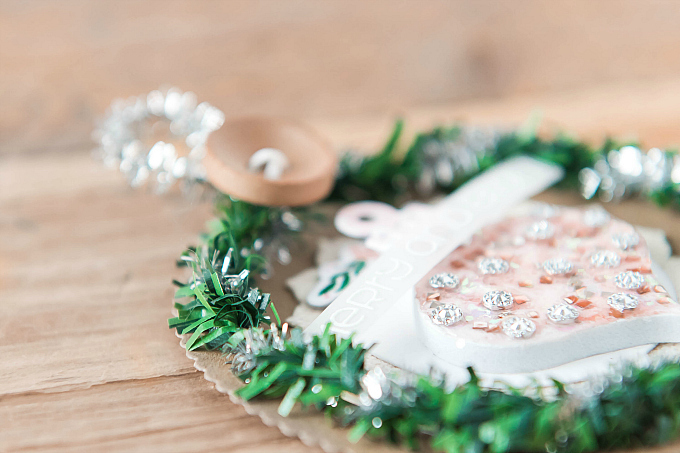 Not only does this technique help keep all the glitter in place, but it acts as a beautiful mirror-like finish, with a lovely hue. Here I used Rose Water Jewel Drops. 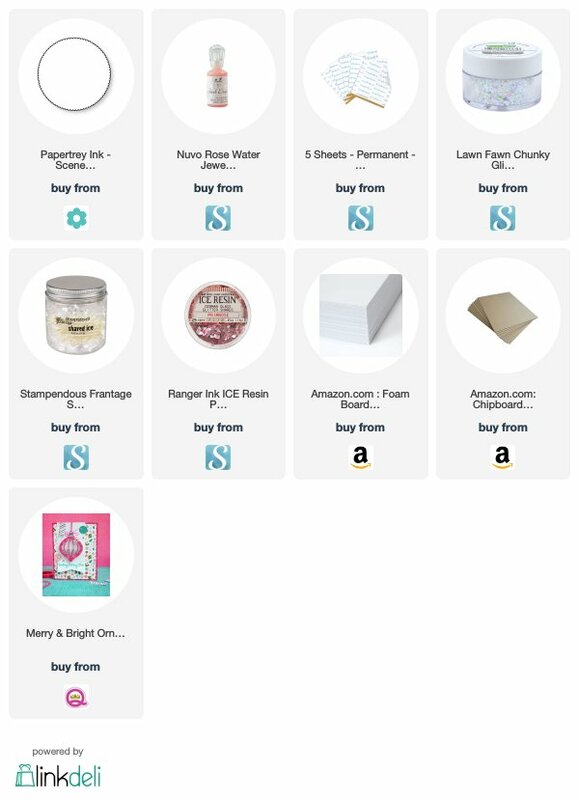 If you don't have this product on hand, you can try mixing your own! Simply add a drop of dye ink to your glazing medium (like Glossy Accents). 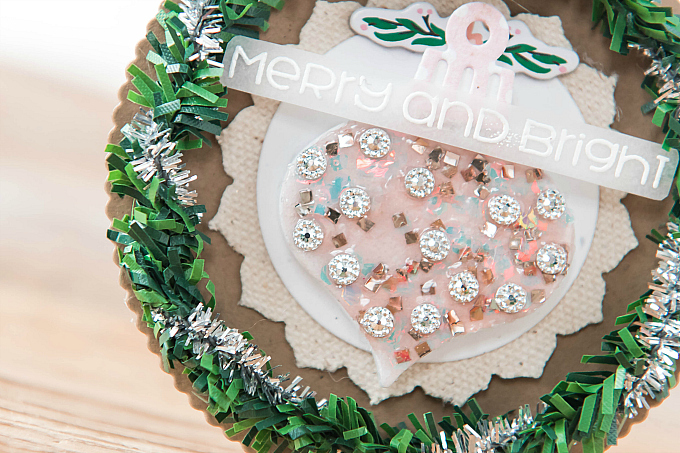 After making this sweet little ornament, I added some darling toppings to pull together a little tag. I used PTI's Scene It Basic Backer die cut in Kraft cardstock, and a smaller, canvas scallop followed by a punched cardstock circle. At the top, I added a wood button, and also a heat-embossed sentiment on some vellum. 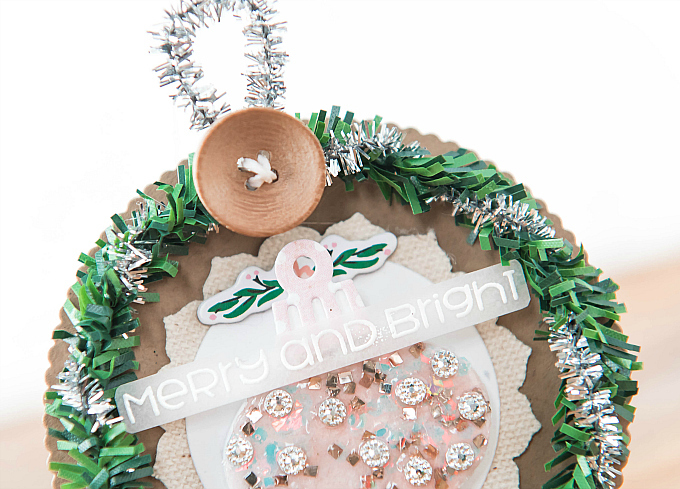 I added some tinsel and greenery all around the tag for a bit of extra texture. Glazing is really fun and easy, and a great way to get extra mileage out of your products. I hope you'll give it a try! How fun! This is pretty Ivana! Thanks so much, sweet friend!! Big hugs and Merry Christmas to you!